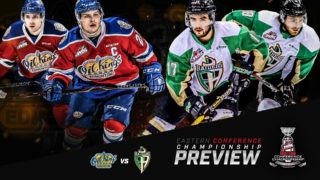 Prince Albert, SK – The Prince Albert Raiders and the Edmonton Oil Kings will face off in the Eastern Conference Championship of the 2019 WHL Playoffs. 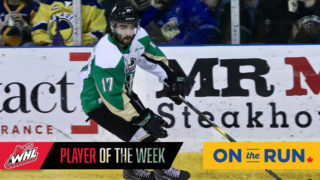 The Raiders eliminated the Saskatoon Blades in six games to advance to their first Eastern Conference Championship since 2005. 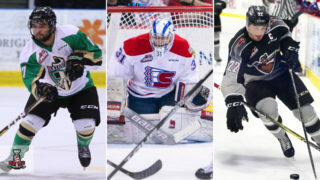 The Oil Kings swept the Calgary Hitmen to make it out of the Central Division. Game 1 of the Eastern Conference Championship will be played on Friday, April 19 at the Art Hauser Centre. 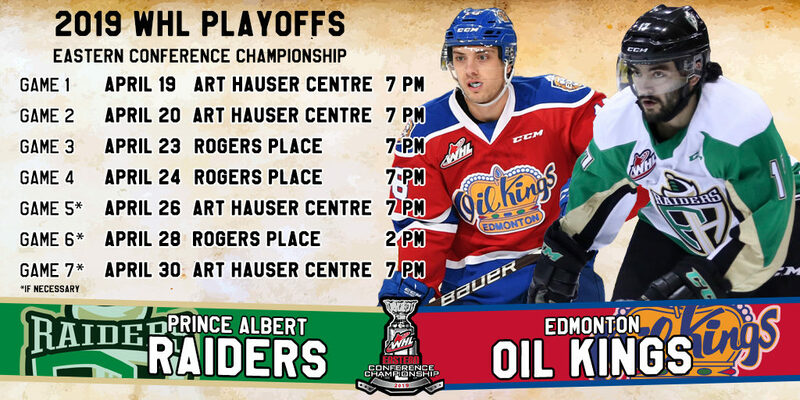 The Raiders won the regular season series 3-1-0-0 against the Oil Kings, including both games played at Rogers Place. Brett Leason led the Raiders in scoring during the regular season with 89 points (36 goals, 53 assists). 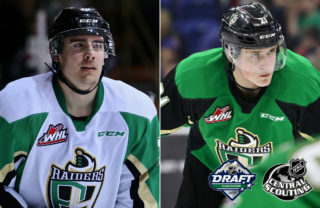 Dante Hannoun leads the Raiders with 14 points (nine goals, five assists) in the 2019 WHL Playoffs. The Oil Kings were led in scoring during the 2018-19 campaign by Trey Fix-Wolansky, who scored 37 goals and added 65 assists. Vince Loschiavo tops the Oil Kings in playoff scoring with five goals and five assists. During the season series, Noah Gregor led all scorers with eight points (two goals, six assists). Fix-Wolansky paced the Oil Kings with five goals and two assists. In the first meeting of the 2018-19 season, the Raiders doubled up the Oil Kings 6-3 in Edmonton on Nov. 28. Parker Kelly had two goals and an assist in the win. Fix-Wolansky recorded a hat trick in the loss. Ian Scott made 31 saves for the Raiders, while Dylan Myskiw stopped 29 shots. 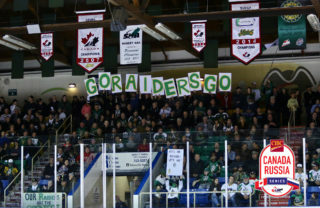 The two teams met again on Dec. 12 in Prince Albert with the Raiders skating to a 6-5 win in overtime at the Art Hauser Centre. Gregor scored both of his goals in the season series in this game and added two assists. 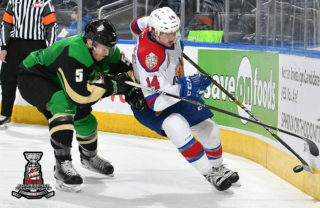 Conner McDonald had a goal and two assists for the Oil Kings. Cole Fonstad scored the overtime winner 3:00 into the extra frame. Donovan Buskey got the win in goal for the Raiders with a 30-save performance. Todd Scott made 26 saves in the loss. The Oil Kings got their lone win of the season series on Feb. 1 in Prince Albert by a 6-3 score. Fix-Wolansky (two goals, one assist) and Loschiavo (one goal, two assists) each had three points in the win. Fonstad scored a pair of goals for the Raiders. Todd Scott made 39 saves for the win. Ian Scott stopped 22 shots in the loss. The season series wrapped up on Feb. 4 when the Raiders downed the Oil Kings 5-1 in Edmonton. Leason had a goal and two assists in the win for the Raiders. Loschiavo scored the Oil Kings’ lone goal. Ian Scott stopped 25 shots to pick up the win. Todd Scott made 41 saves in a losing effort. Tickets for Games 1 and 2 of the Eastern Conference Championship go on sale on (DATE) at the Art Hauser Centre box office at 9 a.m. There is a limit of six tickets per patron. Online ticket sales will begin at 10 a.m. at tickets.raiderhockey.com.